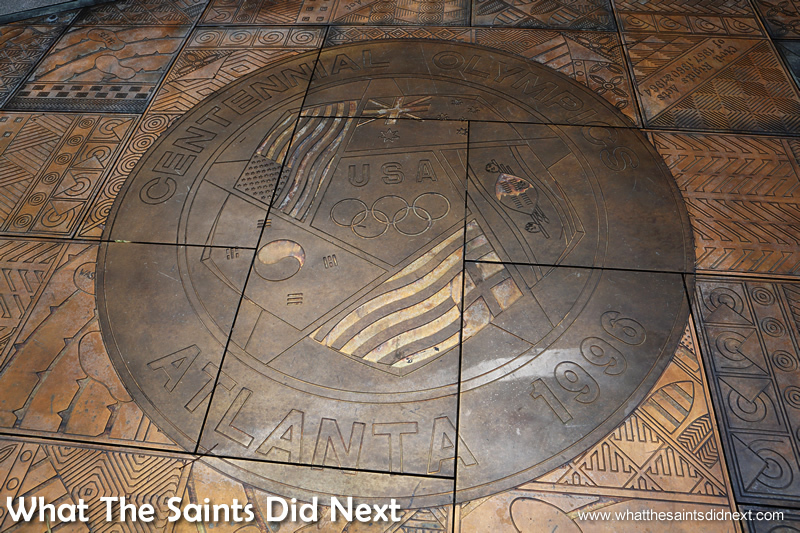 The Olympic tributes are part of the bronze floor around the Andrew Young Plaza. We’ve had more beggars approach us during our first full day in one of the world’s richest countries than we’ve had during our six week visit to Southeast Asia. It’s completely taken us by surprise. 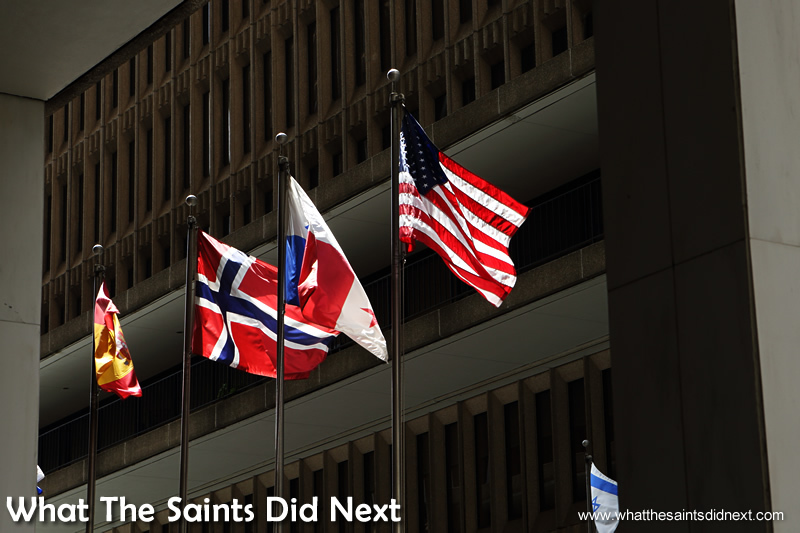 The stars and stripes fly everywhere in the US. Four nights ago we flew in to the USA with much anticipation of our first visit to Atlanta, Georgia, the city we developed a soft spot for, after following the Olympic Games hosted here in 1996. Memories of Michael Johnson’s gold shoes breaking 200m and 400m records; the horror we felt at the terrorist attack in Centennial Park; Muhammad Ali lighting the Olympic Torch and gymnast Kerri Strug nailing the landing with both feet despite an injured ankle to win America’s first team gold in gymnastics. But the city we’ve discovered has been a forlorn shadow of those times, a disappointing Olympic legacy. The Atlanta Olympic Flame is no more. It’s a thought that’s been playing on my mind. 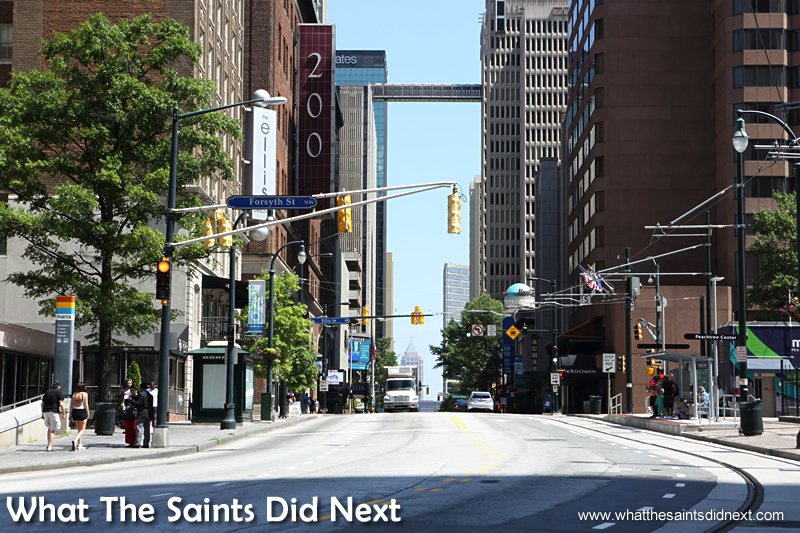 Nearly 20 years since the Torch moved on, Downtown Atlanta is quite deserted of the day to day foot traffic that is common in cities we’ve visited in Europe and other countries. It wouldn’t be fair to call it a ghost town, but it is remarkably quiet, even on the weekend. 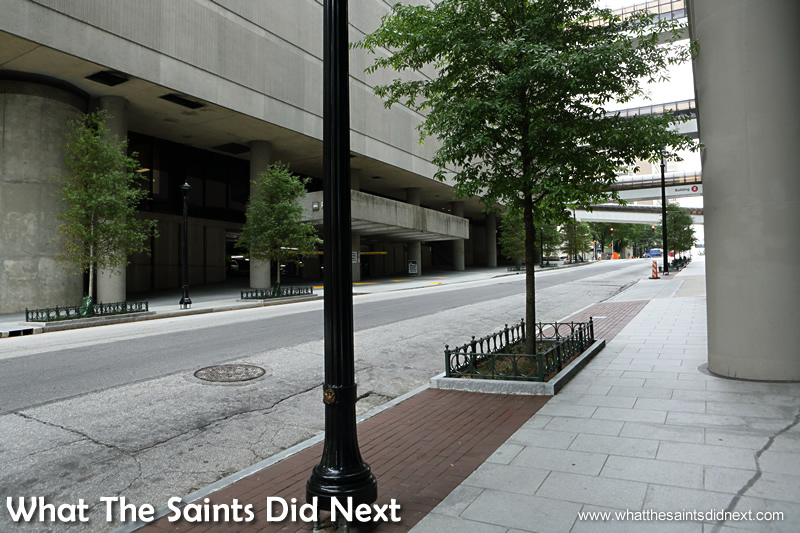 The Atlanta Olympic Flame is gone – The streets of Downtown Atlanta are eerily quiet. MARTA, Atlanta’s underground public transport system – not so crowded. The underground train system, MARTA, is dark (compared to London’s) and bleak; trying to buy day passes at North Avenue station there were no attendants to provide assistance. Once inside the MARTA we soon learned most of the well dressed, middle aged men who make what appears to be friendly, ‘passing the time’ comments, are actually beggars. Offers of help reading the MARTA map or the question, “where are you guys from?” is just being friendly in other countries, but here in the underground and on the streets it’s a common prelude to begging. The Atlanta Olympic Flame is gone -Deserted city streets. Above ground it’s the deserted streets we found most startling for the past few days. We kept thinking perhaps we were in the wrong place, that we would turn a corner to find pedestrians carrying shopping bags, but it never happened. And it’s summer! The weather is glorious. Centennial Park itself is a lovely recreation area, a lasting legacy from 1996. Here we did find people out enjoying the facility, although not in numbers befitting the quality of the park. Children squealing with delight under dancing water jets was great to see. The engraved plaques and tributes to those who helped make the Games a success, are plentiful throughout the park and interesting to read. But never far away are the lone men sitting on park benches under shady trees, no more than one per bench. I suspect some of them are homeless although they don’t seem to have any possessions I’ve seen other homeless people carry, such as sleeping bags or duffel bags. 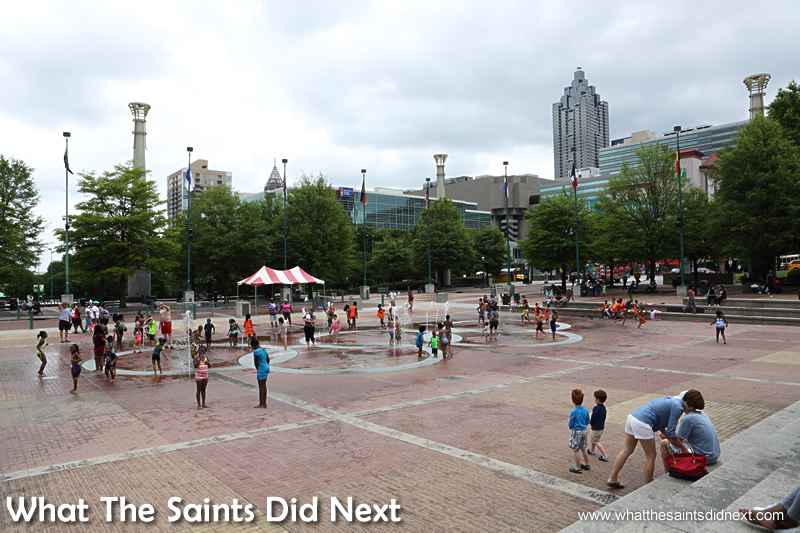 Great to see kids enjoying the water fountains in Atlanta’s Centennial Park. ‘Current Collections’ – a travelling environmental exhibit now on display in Centennial Park. 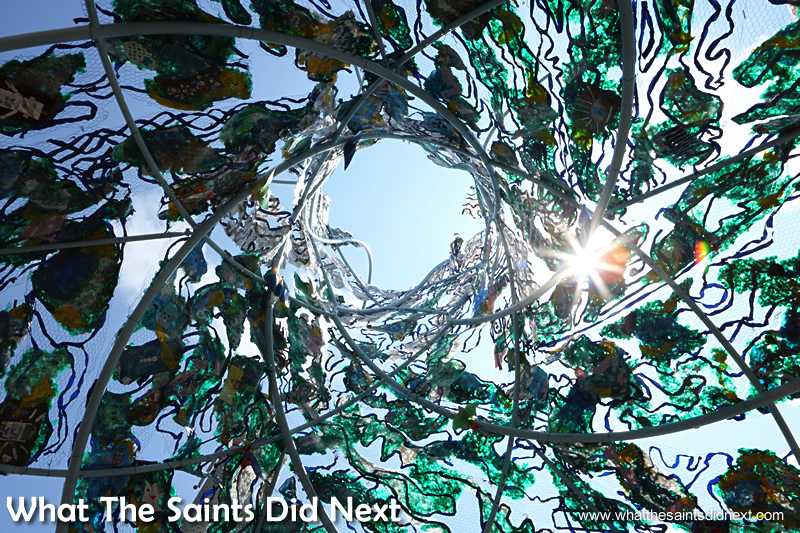 Representing an ocean vortex where plastic waste collects and pollutes the ocean, visitors can walk under the exhibit and look up into it for an inspiring experience. A Tribute sculpture at the entrance of the park celebrates the 100th anniversary of the modern Olympic Games, which took place in Atlanta, 1996. The city’s major tourist attractions are located in and around Centennial Park, including the World Of Coca-Cola, CNN Centre, the Civil Rights Museum and the Georgia Aquarium. Moving away from the Park, on another day, we ventured further Downtown, determined there must be a livelier spot to be found. 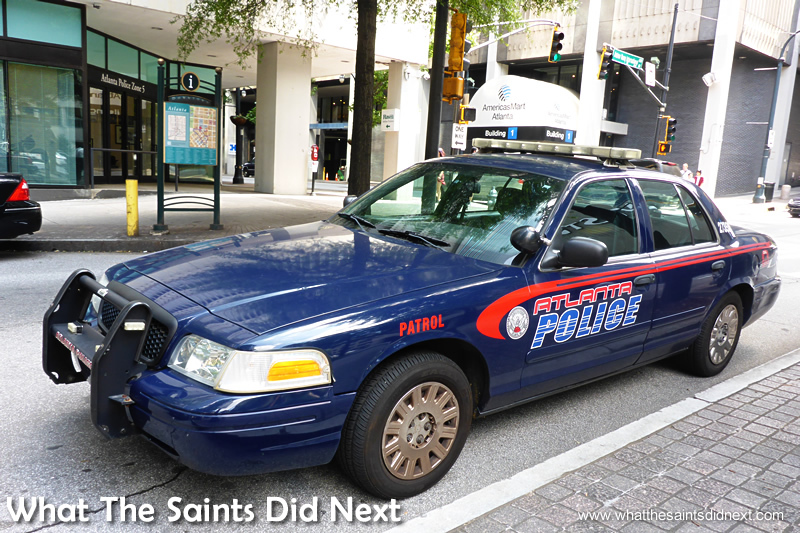 Our tourist leaflets suggest the area around Five Points MARTA station to be vibrant. 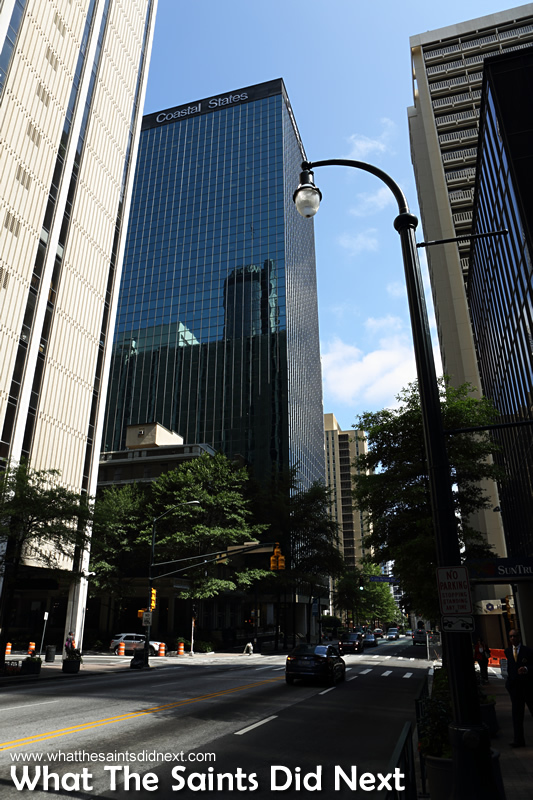 We prefer walking through new places as a means of discovery, so off we strolled along Peachtree Street and into Five Points. What we found was more desperation. We were also shopping for a mobile phone SIM card and wandered into a few outlets which, despite lacking patrons, didn’t seem overly bothered at having potential customers come through their doors. 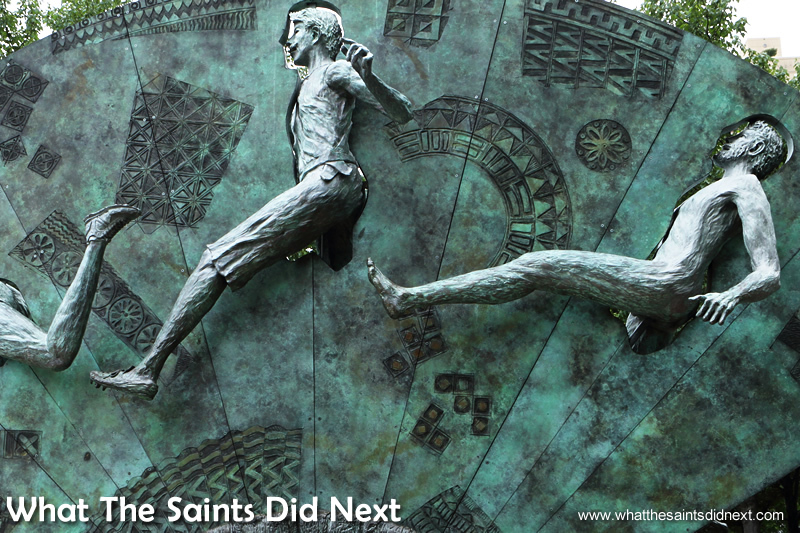 What happened to the city’s Atlanta Olympic Flame? 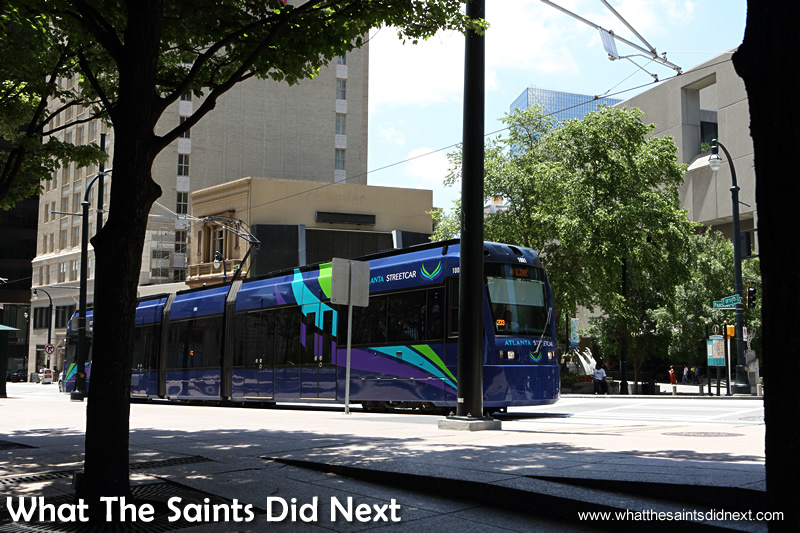 The above ground public transport, Atlanta Streetcar. Our final effort was to seek out ‘Underground Atlanta,’ billed as a ‘cultural hub’ and one of the ‘city’s favourite attractions,’ located under the heart of Downtown. 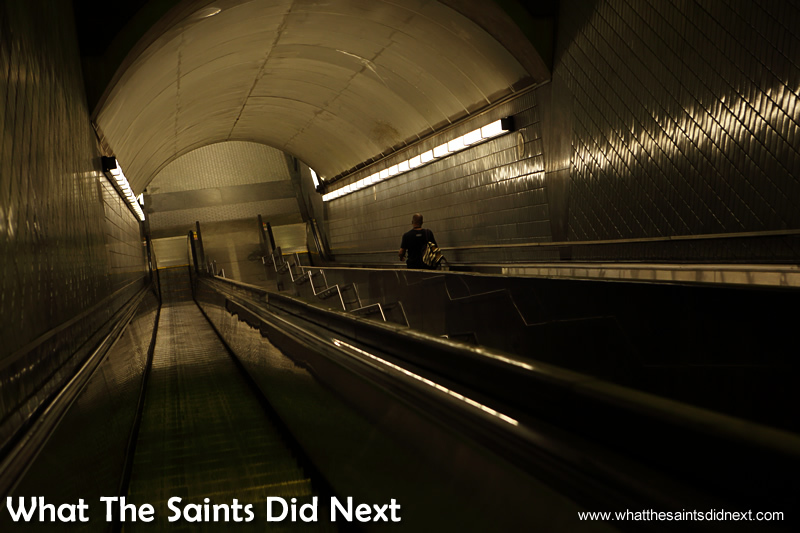 We rode the escalator down from street level and stepped into something reminiscent of a scene from an apocalyptic zombie movie. The underground, faux street like design, quite clearly had the potential to be a trendy shopping district, and at one point it must have enjoyed that buzz. But today it is dark and dreary. We wandered by the different vendors displaying their goods on parked, mobile wagon style stalls. The sellers called out their bargains to us but with little enthusiasm. But my overriding memory of Underground Atlanta was the single men standing motionless around the pillars, almost trance-like, randomly facing different directions. It was quite unsettling and we soon made our way back up to the street level. Even the traffic is sparse for a major city of this size. Many of the vehicles we did see have blacked out windows and we felt a bit strange walking on the pavement when everyone else seems to be in cars. The towering skyscrapers in Downtown, Atlanta. 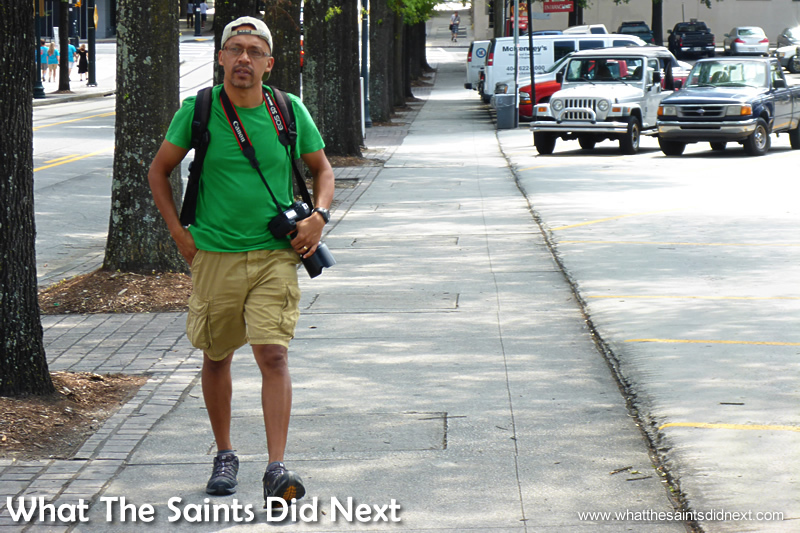 Here I am with my camera out, but in many of the places we went I kept the camera in the bag. Of all the cities and countries we’ve visited, it’s the first time I’ve felt quite conspicuous with my camera on show and decide to carry it in the backpack more than usual. The apparently poor residents of Atlanta is not just my imagination. A city-data.com 2013 report states 24.4% of Atlantans are living in poverty. A 2013 report by The Georgia Budget & Policy says poverty rates are on the increase and that the state has the sixth worst rate in the US. The figures seemed high but then digging a bit more I was surprised to learn London, England’s poverty quota was 28% in 2012. I guess there are many other factors and criteria attached to citizens’ quality of life and isolated statistics alone can never tell the full story. On our last full day in Atlanta, we actually stumbled upon a street event that was fantastic. 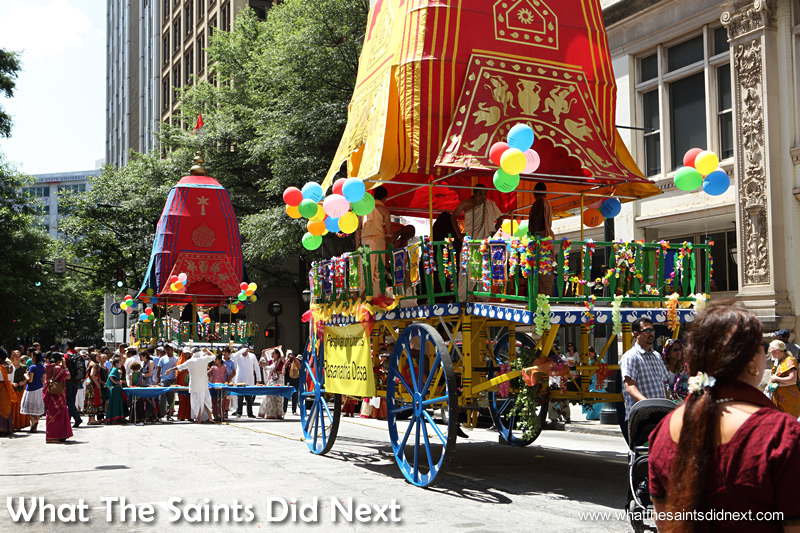 The Festival of Chariots, which originated 2,000 years ago on the east coast of India, was taking place and it was exactly the type of thing we had hoped to see. The Atlanta Olympic Flame, at last. We found the procession after hearing music and discovered a parade assembling in Walton Street. A group of oversized “chariots” on monster wagon wheels, colourfully decked out in bunting. We mingled with the crowd, enjoying the atmosphere and fun taking place in the street but unfortunately we had to leave early to collect our hire car. The ‘Festival of Chariots’ was a lovely surprise. 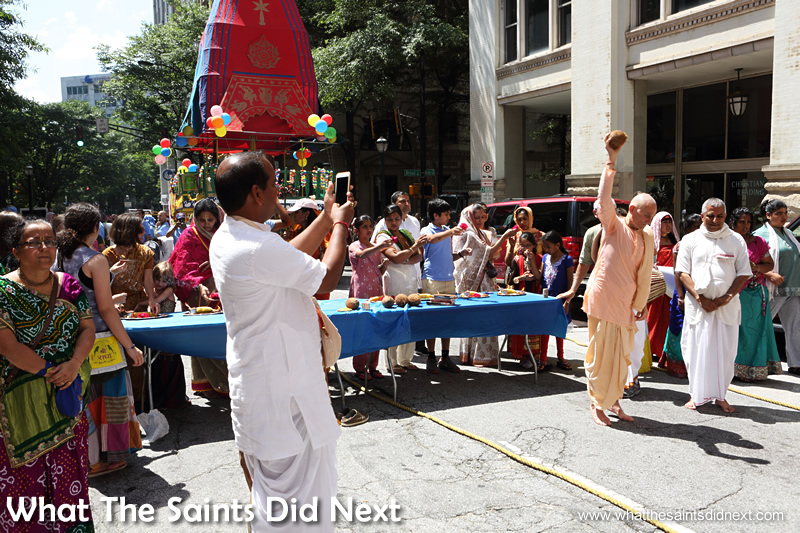 Cultural history from India going back 2,000 years, is enjoying the sunshine of Atlanta. We’re embarking on a road trip through parts of the States tomorrow. Atlanta will still hold special Olympic memories, and some of the tourist attractions mentioned earlier were quite impressive. But at street level, sadly the city was quite different to what we had expected. The Atlanta Olympic Flame is long gone.